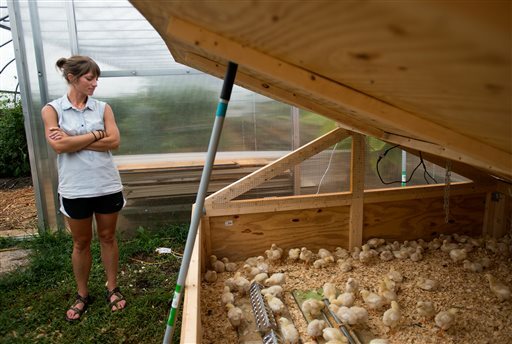 LYNCHBURG, Va. (AP) — Black eyes, orange beaks, white wings and yellow down — these are the features of the ever-shifting, ever-cheeping landscape inside a wooden brooder box at Liberty University Campus Farm. The farm has 160 new chicks that arrived by mail from Ohio earlier this month. The Cornish Rock Cross chicks were shipped immediately after hatching, so farm staff members taught the younglings to drink and eat themselves. This is a major experiment for the three-year-old farm, which produces vegetables but has never raised livestock before. Sure, there are the seven egg-laying hens, brought to the farm as adults last semester, but Alicia Cripe, the farm’s manager, said those are more like pets, providing eggs for just the farm staff themselves. These new chickens, being raised for meat, represent a more serious enterprise and the beginning of a future that might include raising other livestock such as cows and pigs. Taylor Young, the new campus farm livestock coordinator, started work about two months ago. He was brought in to take on the new livestock projects. Raising livestock is something the farm is interested in for its own sake, Cripe said, but there’s also another reason it makes sense. Soil quality on the farm is poor, she said. Livestock produce manure, which helps enrich the soil. Soon, the chicks will be old enough to be transferred to a special sort of flexible pen, enclosed on top, which will hopefully protect the chickens from predators and allow them to roam to an extent. Staff plan to put the pen out on the land and move it each day. “They’ll get to be out there, fresh air, sun, eat some grass as well as fertilizing the fields for us,” Young said. The chickens will live just a couple months before they are processed. The farm plans to do the butchering onsite, giving students the opportunity to learn from the experience. If everything goes as planned, they’ll then sell the organic chicken meat to Liberty faculty and staff. So far they haven’t lost any of the chicks and they’d like to see that luck hold, though it would be normal for a few not to survive until slaughtering. According to Cripe, the farm raises a variety of vegetable products, including onions, squash, sweet potatoes and tomatoes. They’ve also got the beginnings of a small orchard. Their produce goes to Liberty’s farmer’s market, to a new restaurant on campus and to faculty and staff. They also sell to a couple local restaurants, including Benjamin’s and Rivermont Pizza. Cripe said the main reason for the campus farm is to provide an enriching, interesting experience for students. Also, she said, they are interested in teaching students about stewardship and environmentally friendly farming practices — the kind that leave the land better off. “We want to inspire students to see the Earth as a gift from God,” she said. Tags: Campuse life, education, health, Lifestyle, student, Virginia. Bookmark the permalink.